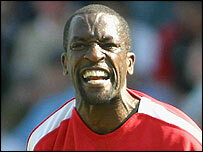 West Ham have signed Charlton's former England defender Chris Powell on a one-month loan deal. The 34-year-old left back, capped five times by England, has not player a first team game this season. Charlton manager Alan Curbishley said: "Chris is frustrated because he is on the fringes. I understand his predicament so I'm letting him go out. "He needs competitive football. We will see what happens in a month's time," added Curbishley. He said: "He was on the fringes for all of last season and only played a handful of games when he wants to be playing more. "He re-signed for us in the summer and I understand his predicament so I've let him go to West Ham on loan for a month - no-one else will be going. He needs to play some competitive football. "He played in a reserve game on Tuesday but for most of the guys who played in that it was their first match in five weeks because so many have been called off. "The move will help West Ham while Chris will get some competitive football in - we'll see what happens after the month."